Luxurious Canadian hotel turns to hospitality’s leading security technology provider to increase security and efficiency with VingCard Classic RFID locks. Stockholm – April 25, 2017 – Fairmont Hotel Macdonald, an iconic four diamond luxury hotel located in the heart of downtown Edmonton, Alberta, announces the successful installation of ASSA ABLOY Hospitality’s VingCard Classic RFID door locks and Visionline locking solution. Known for its state-of-the-art guestroom amenities, Fairmont Hotel Macdonald selected ASSA ABLOY Hospitality’s innovative locking solutions to enhance overall security for its guests, while blending with the property’s traditional décor. Prior to the implementation of ASSA ABLOY Hospitality’s locking solutions, Fairmont Hotel Macdonald was using a competing locking system that had become obsolete. 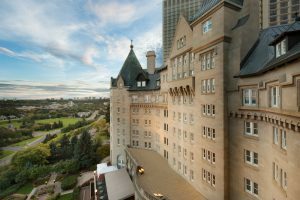 After considering another competitor to replace the original locking system, Fairmont Hotel Macdonald ultimately turned to ASSA ABLOY Hospitality to update the hotel’s security abilities with the VingCard Classic RFID door locks. The management team at Fairmont Hotel Macdonald chose to work with ASSA ABLOY Hospitality based on its ability to meet the hotel’s specific needs, including superior service and reliability. ASSA ABLOY Hospitality’s status as a corporate-approved vendor and its compatibility with the hotel’s soon-to-be installed communications system were also among the top reasons for the hotel’s decision. Additionally, the installation of ASSA ABLOY Hospitality’s Visionline will work in tandem with the Classic RFID locks to allow hotel staff to see which guests have used their key to enter certain areas of the hotel and when. By enabling this capability, the hotel can now effectively monitor entry into certain sections and areas of the property. Any time a keycard is suspected of being stolen or used inappropriately, hotel staff can instantly deactivate that card from one central location to prevent any future unauthorized entry, further increasing the hotel’s security protocol.